Today I’m thrilled to have Deborah Niemann sharing her knowledge with us. 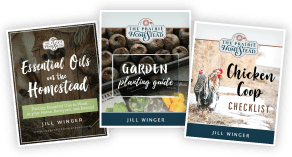 She is an author, blogger, and homesteader extraordinaire. She also recently published Raising Goats Naturally: The Complete Guide to Milk, Meat, and More. She is a wealth of knowledge, and I think you’ll enjoy her post as much as I did! Although my initial decision to dam-raise was simply based upon my own gut feelings, after eleven years of raising milk goats, I now have some solid reasons for continuing the practice. 1. I prefer the personality of dam-raised kids. Like most people, I thought they were adorable the first few times we had to bottle-raise kids, but after some bottle kids killed most of our young apple trees, I started to reconsider. Dam-raised goats have great herd instincts and want to stay with the herd. Bottle-raised kids view the humans as their herd and can find the tiniest opening in a fence or gate and escape. And once they’ve escaped, they can find all sorts of trouble — like stripping the bark from young fruit trees. 3. Dam-raised kids tend to be healthier and grow faster. As long as my kids are nursing, they don’t usually have problems with parasites or other health-related issues. A doe’s milk has natural antibodies to all of the microscopic bugs on our farm, from bacteria to parasites, and this helps to keep the kids healthy while their own immune system is maturing. But what about all the reasons people bottle-fed kids? What about diseases that are passed through raw milk? Of course, you don’t want to dam-raise kids if you have does that are positive for CAE or Johnes. However, there are plenty of other reasons you don’t want does in your herd that have CAE or Johnes. I purchased all of my goats from herds that had negative all-herd tests for CAE, and then we tested them annually for several years. Once my herd was “closed” for more than one year, I tested every goat for CAE, Johnes, and CL. Whenever we have an unexplained goat death, we have the body necropsied so that we know the cause of death. After eleven years of having healthy goats, we feel very confident that we have no latent diseases hiding on our farm. The decision of whether to dam-raise or bottle-feed is ultimately a personal one that will likely mirror other health decisions you make in your life. Although many people choose to dam-raise because it simply feels like the right decision, there are some good reasons to let mamas raise their own babies. Win a copy of Raising Goats Naturally! Interested in more homestead goat-keeping posts? My Goat 101 Series is jam-packed full of tips, tricks, and info! My number one problem is startup costs; fencing, etc. Containment is critical. I run an on-pasture managed rotation grazing system. Keeping the goats in the paddock and secure from predators requires a great expense in electric netting. My #1 problem is I dont yet have any goats :0) We just bought our homestead site and hope to have it set up for goats next spring. I think my number 1 problem with goats and goat care is resources. many natural books seem antiquated. although the internet is a great source of brainstorming ideas, people write anything claiming to be professionals when they clearly are not. It’s hard to separate fact/fiction and newbie/experienced. (same with how-to’s, but that’s another rant!) This book, and author look great. i look forward to reading it. I have not yet had the chance to raise goats. We are preparing/building the area now for we can start this coming spring. I would love to have this book for we can also be prepared to raise them naturally, they way they were meant to live. Thanks for the opportunity to try and win this book. My number one problem is fencing. It doesn’t seem to matter how much we fence, one of them finds a way through. I agree that bottle babies are a pain as they grow up. They are in front of you all the time. I let the babies nurse as long as the does will let them and get more that enought milk for my family. It is a win/win for me. My #1 with goats has been finding a goat vet. All the local vets I have found so far limit their practice to small animals or horses. Kidding during the cold Michigan winters. Love reading about goats. I’m on the fence about what dairy animal I want in my operation. As a slightly disabled pushing 60 woman I need to be realistic, but having said that, I LOVE RAW MILK!!! So this book is interesting to me for my Farm-Based Educators program and the idea of having children here on a regular basis makes me think I could find takers on playing with kids. I do have sheep now for wool but am wondering if there is such a book for raising sheep naturally. I recommend Nigerian dwarves. Easiest to manage. This article convinced me to dam raise. 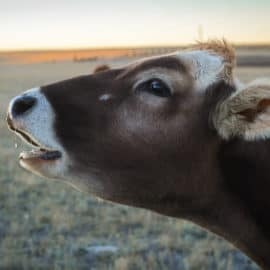 I worked for Laura Chenel chevre & although the animals were treated humanely I did feel sorry for the kids who would cry for me to stay & cuddle them. Even after feeding they were obviously very much in need of a “mother” to sleep w them. Mexicans buy up the baby bucks to butcher & having seen how they treat them I know that commercial dairy model is NOT for me. I eat meat but I avoid meat from anywhere I don’t know because of how i watched Mexican laborers butcher. Laughing at the animal in its agony. Look at the Tyson factory chicken raids… why is it hard to find Americans willing to abuse animals for $3 per hour and why are we happy that illegal aliens will participate in this evil so that we can have unnaturally cheap meats & food?? Sickens my stomach. I do not have goats yet so I am soaking up as much info as possible! I am very concerned about the cold weather and my animals. Funny how the most natural ideas make the most sense when all factors are examined…..I’ve always thought that it just wasn’t right to take away the young from their parents and feed the babies inferior food and expect a hale and hearty adult. Great article! I really enjoyed it. My goat mentor suggested when we had our diary goats that we do not let the kids stay with the doe because they could be too rough on the udder bag, therefore breaking blood vessels and allowing blood to enter the milk. She also thought it was a great risk for mastitis. For her, the answer was to bottle feed from the start. I like your point about the “naughtiness” of the kids…we had a similar experience with bottle fed lambs on our farm – V*E*R*Y – sassy and independant lambs who wanted to come into the house and would cry and cry whenever they saw us! Adorable, but can get “old” very quickly :). Thanks for mentioning that! Ironically, in 11 years, the only time I have ever had a doe with blood in her milk was when I bought a la mancha doe in milk from a herd that bottle-fed all of their kids. So it was the humans (or machine) milking that had caused the blood in her milk. We have never had that happen with our does that dam raise their kids. AND we never had a case of mastitis until after we bought a milking machine. In 11 years now, we’ve only had 3 cases of mastitis. We went 9 years without a single case of mastitis in our goats. We’ve never had a case of mastitis in our sheep or cows, and they always raise their own babies. Well, you have definately inspired me! Thanks for the insights and for sharing your experiences. Gotta love farming… the approaches are as unique as the wonderful people doing them. Our #1 problem is we are scared to death to try goats. We have almost every other farm animal (besides goats) but have heard so much negative about having goats, we don’t know if we can do it. We are going to try Spring 2014 because we have a major thistle problem in our pasture where we raise grass-fed cattle and pastured heritage pigs. We’ve been trying to figure out the best goat breed for eating down thistle. All the things books(etc) say you ‘must have’ before starting with goats are not all together true. Goats(especially the kids:) are a lot of fun. Don’t get bogged down with worry. What goats need basically is only: Food/Water, Shelter, Fencing, and Mineral. Have fun! Enjoy them! Great! Thanks for the advice. That is my problem, too, Kathy! My biggest good fortune is also my worst; I live in town and am limited to the number I can have. The Nigerian Dwarf goats are so very precious and are the hit of our neighborhood. My biggest problem is that I don’t have goats yet! But we plan on it in the very near future, so I’m trying to learn everything I can. Our number one problem for a long time was packs of dogs killing my goats. The last time they came through, they killed 27. I started looking for an answer other than my hubby’s which was get rid of the goats. I purchased two LGD and have not lost another to dogs. That has been 8 years ago. We love and appreciate our dogs! My number one problem with my goats is my inexperience. I’ve only had mine about 6 months and I am constantly running into things I don’t know. Figuring out where to start! We have been trying to figure out how to begin for several years now but are still goat-less. So far we have some pasture roughed in after logging and a shed or garage area ready to turn into a stall. Electric fencing is a perplexing and costly issue and the farm supply websites and catalogs leave me with more questions. Our biggest problem is goat health…we have them die and don’t know what causes it. And we can’t afford testing to see. We love our goats and they are such fun! This book would be amazing. We had that problem the first few years we started, even though we were paying for necropsies. I never had a buck live past the age of 3 the first five years I had goats. The vets kept saying it was just parasites. Ultimately, after doing my own research, I told the vet I wanted a dead doe’s liver tested for copper, even though he told me copper deficiency was impossible. Her liver came back at 4 ppm when normal is 25-150 ppm, so she was certainly deficient! Symptoms of copper deficiency include fertility problems (failure to get pregnant and stay pregnant) and hair issues (not shedding in summer, faded color, fishtail, shedding on face), an inability to handle even a low load of parasites, poor immune function, and of course, death. Thanks so much for your reply. We will definitely look into that. We give them minerals made for goats to make sure they get selenium. I’m pretty sure it has copper in it too. But I will look at the bag again. I’m studying nutrition for humans but I joked with my husband that I’m minoring in goat nutrition. The mineral should have at least 1500 ppm copper sulfate, and the grain should be at least 35 ppm copper sulfate. But that would only guard against primary copper deficiency. You could wind up with secondary copper deficiency, meaning that the goats are consuming enough but it isn’t being absorbed because of an antagonist in the diet, such as sulfur or iron in the well water or too much molybdenum in the diet, which can be caused by too much alfalfa. In that case, you will need to give additional copper, such as Copasure. And even though they finally started making one labeled for goats, their label dosage may not be enough in some cases. Thanks! We don’t feed alfalfa so that wouldn’t be a problem. I’m not sure about the water. Unfortunately we are on county water, but they also have access to a small stream. I hate that we have chlorine and fluoride in our water, but our well needs a new pump so we have to go with that for now. I’ll look at both the minerals and the grain for those levels. If I don’t win this book, I might just have to buy it! Thanks for taking the time to reply. Being able to find backups for when I need to be out of town AND my Houdini goat lol! This goat can get into and out of anything. Last week she showed up in my house!! They are to smart! We have electric fencing and the goats were still escaping after several times of returning them inside the fencing we watched to see how they were doing it. They were jumping on a lower branch of a oak tree and walking along the branch and jumping down on the other side of the fence. i didn’t know goats climbed trees we had to move the fencing because once they learn to do something there is no stopping them! This is great news, and as always, great timing. The only issue that I’ve run into so far is a sweet, hand-raised doeling that doesn’t want her udders touched! It may be a different story when she’s full of milk and the release will be welcome, but for right now I am anticipating getting our own milk!! Thanks for the update. We don’t have goats either! But have been thinking about it for quite awhile. They keep escaping!! We have had goats for 3 years now and have tried all kinds of fencing. Even with the electric netting they will just jump over it when they want. Our number one problem is no goats. The people kids would like a dozen or so goats because they love goat milk. We are researching how to properly care for them. The biggest problem we run into is worms. Having raised cattle for years, it see seems we are ALWAYS having to deworm. My problem has been finding a vet who has knowledge in goats AND a positive mindset towards goats/goat milk. When I tell people I have dairy goats most turn up their noses—- until they taste the milk, cheese and ice cream!! I’m fortunate to have a heard of lazy Nubians 🙂 they aren’t into testing fences. Our main problem is finding time for hoof trimming and putting up good solid housing for the bucks (that’s a money issue also) Our girls are drama queens, and hoof trimming is sometimes scary. They put up such a fight! You would think we were pulling their feet off instead of giving them mani-pedis! After over seven years of keeping goats, and trying all sorts of positions and methods of hoof trimming, we still dread it and don’t do it as often as we like or should. Our #1 problem with goats, we raise Angoras and pygmies, is keeping the Littles (pygmies) in the fence…lol. Seems to be a trend here. I would love to try some dairy goats but don’t know if I want to devote all of the time for milking them…..we have plenty of friends who do this so still holding off. Right now we do not have any goats on our farm. I am doing my research and learning as much as I can at this point before bringing goat home. We want to raise goat for all the good qualities that they have and this book will help me in this learning time. Thanks for your blog and this offer. No major issues now (other than goats are addicting) but I know my #1 issue will be milking my goats when the freshen! Only one has ever freshened before (and I have her daughter) but was never milked, just nursed. So none of them are used to being handled like that, though I have been working with them! I would LOVE to win this book, as I also want a meat goat or two in addition to the dairy goats! If you have a milking stand start using it for feeding the future milkers, and handle them on it (brushing, etc). They learn quickly where the food is. Milking is another issue. I’ve had some first timers that took to it, some that never would stand still and even try to bite me. Be persistent and don’t give up. Be the alpha animal and don’t let them bully you. Sometimes a shoulder pressed into their side/shoulder with the stand against a wall will calm them down. My biggest obstacle is that we don’t have goats yet. Still working on setting up the homestead. We would love to get a few meat goats int he spring. This book would be a great resource! #1 problem now is i broke my back and can’t play with my wonderful full grown babies. Truly our #1 problem is – not enough $ to feed, fence and keep every goat that one of the family members is in love with. This was a long challenging year for us on the homestead and had to put down 2 of our favorite “girls”, we always strive to learn more and I can’t imagine ever looking out my door and not seeing goats! I haven’t read the book yet, but I’ve had goats for 12 years, dairy goats for 4 years. We have a large amount of iron in our water supply. It prevents the absorption of copper which is critical for goats. We give free choice goat minerals but I feel they need a copper bolus. I have a terrible time giving it to them. I’ve used capsules which they seem to spit out or chew, and fig newton cookies, which allows them to chew some as well. Total of meat and dairy goats is 34, so it’s lots of wrestling and spitting. Chewing the copper is not a problem. There are two studies that I’ve seen where they let the goats chew the copper (one top-dressed grain, and one put it in a marshmallow), and it worked just as well. I’ve been simply top-dressing the doe’s grain on the milk stand for several years now (ever since reading that first study), and it still works. And we had lab-diagnosed copper deficiency before. The only ones I bolus any longer are the kids because when you separate them from the others, they freak out and won’t eat anything! Thanks! Maybe my wrestling time was well spent. I may try marshmallows the next time for my goats that will eat treats. And not obsess about them chewing. MY #1 problem is that we don’t yet have goats. We are saving up for a homestead and hope to purchase one in the next 2 years. I’d love this book for some training in what to expect! The big problem – fencing – start up costs, installation, and keeping them contained. The book sounds like a great resource for both dairy and meat goats. I like the idea that the information is about “natural” care. My number one problem WILL be the set-up costs. I’m in the beginning stages of researching on raising goats and will be buying a home soon. I want to find one that has already had the barn/fencing done, but chances are I’ll be doing this once we get settled. My other problem is when I ask the other (few) goat owners I know about raising goats, they are very flippant about it and say “just do it, it’s not that hard!”. I want to know about feed, bedding, goat garden foods to grow… I want to do those the right way, meaning a way that makes the goats happy and healthy and yields the most milk and possibly meat. I have raised kids on the bottle and on the dam. #3 is definitely true! Dam raised kids grow MUCH better. I have found that a couple weeks on the dam and then moving to the bottle works quite well, too, if you feel you need to bottle feed. #1 hasn’t been true for me. My kids get out and eat my fruit trees when they are still on mama! 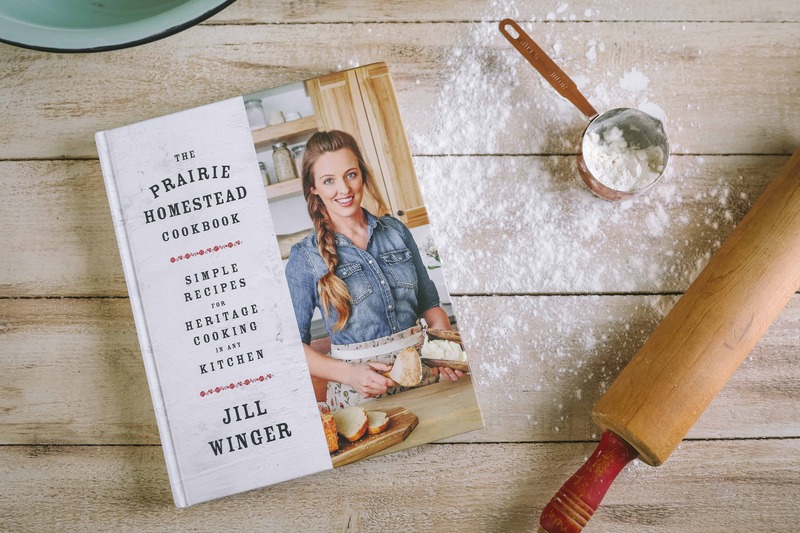 I would love to win your book! My biggest goat problem is fencing and I think the #2 problem is finding a good goat ration! We don’t have any goats, YET. Have been thinking about it. Have been doing a lot of reading. This book would be fabulous to have. This past summer we kidded late spring early summer. That is later than we normally like to. As a result we lost over 10 kids to “floppy kid syndrome” this past summer. Basically it is milk souring on their stomach in hot weather and releasing toxins (or so I have been told). Hmm … haven’t heard that before. I hope your vet wasn’t the one who told you that. The cause is unknown, and they are not even sure if it’s contagious, but in any case, milk doesn’t sour in the kid’s stomach due to hot weather. Floppy kid syndrome is actually tough to diagnose, as it could have just been a kid that was near death for another reason. Since about half of kids with floppy kid will recover without treatment, if all of the affected kids died, then that probably wasn’t it. I personally no longer kid during that time of year because parasites are really bad then in our area (Illinois). Just a thought — when you find a severely affected kid with parasites, they could resemble a floppy kid. My #1 goat problem is building fences, barn gates, water tanks, and hay feeders that are capable of housing goats AND cattle. My husband has come up with some pretty creative ways to keep the cattle out and still let the goats get to their grain/hay/water. I really liked this article, helps give me input for our upcoming goat purchase. thanks! The number one problem I have had with goats is trying to completely eliminate chemical wormers. My #1 problem is that my goats are so darn cute, I have to force myself to work each day in so I can get home and hang out with them. I find myself laughing out loud at their antics. Such a joy! So far in our limited experience, containment was our biggest issue. Goats are little Houdinis! #1 problem. Not buying CAE negative does. I only have 2 does and didn’t think pasteurizing would be very hard… But it is kind of a hassle. I can’t wait to see the fruits of my labor and be able to allow dam raising of the next generation. Great post! Thanks! Keeping them where I want them and keeping predators out. I am a stickler about fencing so it is expensive and where we are now, we do not have goat resistant fencing. Maybe someday again. Chinese saying: If you think you have no problems, get a goat. Trying to find the best feed/hay etc within my price range. We don’t have goats yet but the hubs said if the kids and I learn everything through the winter, he will build the little barn and fence in the spring. The kids are really excited, almost as much as me! We bought our country home about a year ago and so far we’ve successfully done chickens through a Montana winter. Anyway we need our own raw milk source plus the kids need more chores to develop work ethic and responsibility, so goats seem like a natural step for us (plus they are just fun.) We have had our eye on a goat raising book put out by FFA but now I’m thinking it may not be the best one available for our natural-minded needs. Thanks for all the info on raising goats! My #1 problem is convincing my husband that we should get goats 🙂 When I finally do convince him then it will be what breed to get and I’m sure we’ll have some trial and error with fencing when the time comes. I loved reading all the comments to know that so many people are exactly where I am—I want goats, BUT everyone tries to talk me out of goats because they say that they are IMPOSSIBLE to contain—no matter what you do for fencing. So that is my number one problem, too—fencing! The number one problem is time! As a year round milking dairy, i get one 4 day vacation per year, if my interns are trained well enough, and that is the only days off i truly ever get. It seems like there is never enough time to stay ahead of the next thing that needs done. My #1 problem is due to being a city goat owner. The goats have learned really fast to beg and holler to eat and that I will feed them. I need to keep the neighbor’s happy, the goats quiet and not break the bank on feed . The goat that tended to be overweight I sold. My #2 problem is my doe recently head-butted my toddler and I can no longer trust her with small children. Thank you for your goat post! I am still new in owning goats. 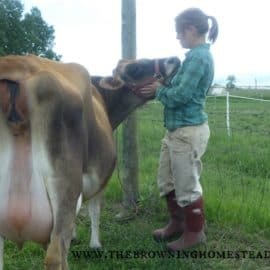 I had my first season of milking and loved it and stressed too. My #1 struggle was my goat Appleton kicking and not wanting to be milked. We certainly had good days and received a lb. more than a couple times, but when she was done eating…that was it! Wrestling was not fun! And I don’t want her to resent me either. A long time goat owner gave us some advice once and it has revolutionized milking time here. She said that she doesn’t use grain on the milk stand but instead gives it a a reward afterwards. It took our girls a few days to adjust but it was worth it. They now behave the entire time until they are done in anticipation of their grain treat and there is no more kicking and fussing because the grain has run out while they are being milked. Thank you Kimberly! I will apply that tecnique in the spring!! “Wish I thought of that!” moment. Never stop learning. Again, thank you for sharing your knowledge and experience. My biggest problem is knowing what to do when there is a problem. And then the problem of finding someone to care for the goaties so we can go away. The number one difficulty we have is finding medical care for our herd. We have learned to do most thing ourselves bit there is no veterinarian for livestock anywhere near our area. I have had our small animal vet do some things for us but he is not very excited about it. As we are new to farming anything larger then chickens or rabbits and wanting to get some dairy goats, finding reliable information is out number one difficulty. Our biggest problem is not really knowing what we are doing! We don’t know any fellow goat owners in our area (northeast pa) so we are learning as we go. I finally found a vet that come come and visit them after calling every vet in the area and asking for recomendations! This article makes a lot of sense and I think we will dam raise when we have kids. I noticed our bottle baby does try and escape the enclosure and bleats at us often while the other goat is perfectly content in the yard. Thank you for this article. I’ve never been comfortable with the whole bottle feeding thing. We know its not best for human babies, so it only makes sense that it’s not best for goats either. My number one problem is that we spend more money on our goats than we get out of them………. and we built the barn too far away from the house! Our number one problem is getting does that were bottle fed themselves to accept their babies. We have bought a few that were bottle fed (way more common to find here than dam raised) and these does freak out when they have babies and want nothing to do with them. The ones that have been dam raised have made wonderful mommas. I also agree that the dam raised goats are much more enjoyable to be around in the long run. Thank you for this article. We’ve been planning to try leaving the babies with the mamas this next year and not bottle feeding them. It goes against our goat mentor’s advice. And that is difficult for me to do without worrying that all will turn out poorly. We bottle fed all babies this year and while we enjoyed the process, it did create more work for us and it bothered me to not let the babies nurse and bond at all. Your article has encouraged me that the way we are heading for this next round of babies really is doable and can have positive results. Thank you again. My biggest problem is sourcing Orchard Grass at a reasonable price throughout the year. When I can get it directly from a farmer I know, I pay $13 per bale delivered and stacked. But in the winter when he’s put up the last of the hay and is using it to feed his own herd I am forced to purchase it from the “local” feed stores (30 min – 1 hr away) at upwards of $22 or $24 per bale. My urban homestead is located in a large city, so my options are limited. I can only store 6 bales inside my “barn”. I try to stock up before winter by having a stack of an additional 6 or 8 on a pallet in the driveway. But I always end up having to pay a premium for 4 or 5 months a year. This year I finally bought a hay net from Cinch Chix that holds a full bale. Since I’ve been using it I have had a 30% – 35% reduction in waste. To me that’s HUGE. Every goat owner will tell you that goats waste a large portion of their feed hay. But now that isn’t a problem for me. Which means that the higher priced hay will be a little easier to deal with. Here’s a link to my review of this product. And no, I am not getting any kickback for the endorsement. I just really like the product and think others could also benefit from the waste reduction. I agree with Kim in Northeast PA. I want dairy goats but, I would LOVE to have a mentor who has experience. Not that I would blindly follow advice without doing my own research. It would be nice to have a friend who knew something about what I am trying to do though. I’m in Southeast TX if there are any goat keeping homesteaders out there! My number one reason is the start up cost. I bought a house with a nice big pasture, but now I am broke. I anticipate the next problem would be if the goats had too many babies—I don’t think I could part with them!! My #1 problem is inxperience. We’ve only had our two goats a few months, and don’t really know what we’re doing. But it is going surprisingly well. We love the milk. Now to just be able to successfully make cheese. That’s my number 2 problem!! Haha. I love this article but it left me with questions about milking. I dam-raised for 3 months, at 4 months I am weaning so we get milk. I am wondering how, if you allow the dams to fully wean their babies, when do you get milk? What does the goat milking process look like for you? Since weaning one week ago, the production of milk seems lackluster, about 3-4 cups in the morning and 1-2 cups at evening. I don’t keep production records but it seems lower than her last time in milk. My biggest problem so far is getting my best doe pregernant. Last year she didn’t settle, so I am trying again. We are keeping our fingers crossed. This will be our first kidding season if she settles. So we shall see. I know they will be dam raised its the only way to go here. You didn’t say whether you own your own buck, but if you don’t, it can sure be tricky to catch them in heat and get them to the buck at just the right time. If you do have a buck on your farm, and she didn’t get pregnant, there could be a problem with selenium or copper deficiency. Thanks for your input. I do have a buck on my farm but I don’t use him for her. I took her to a friends farm for left her there for 2 1/2 weeks. She did so interest in the boys so I am hopeful. Copper and Selenium were given a month before I took her there. Hopefully she becoms a mommy again. My #1 problem is selling the kids! I want to keep them all! My number one problem with our first goat kids (while we had them) was that they were incredibly whiny and would wake us up long before daylight and whine all day for attention. 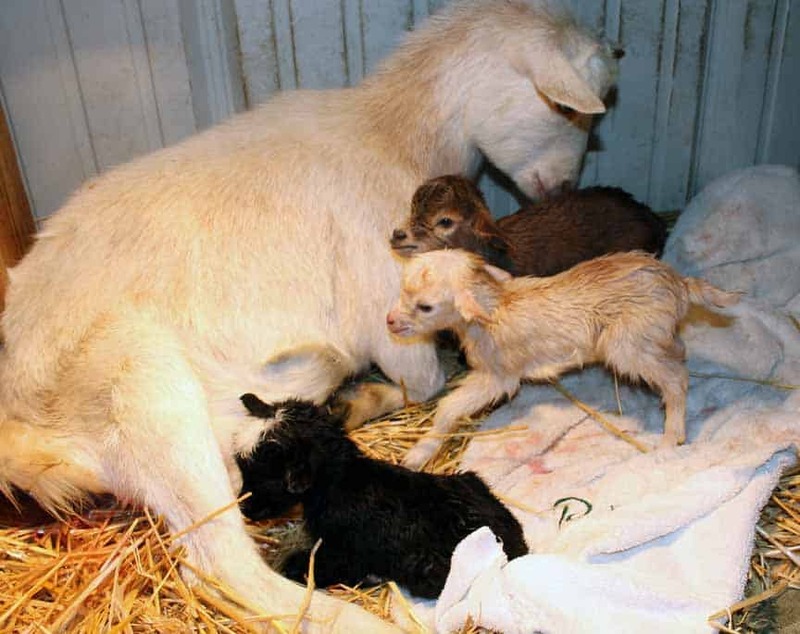 They had been bottle babies, and I’ve heard that can make for extra whiny goats. We had to sell them when we moved across country, but when we get a new property we will definitely be getting goats again and will be making sure they were dam raised. Thanks for this article! I guess our biggest problem is onery goats. Which in reality is probably not that big a problem. Overall our goats are pretty good and can be very funny. They do have a mind of their own at times though. 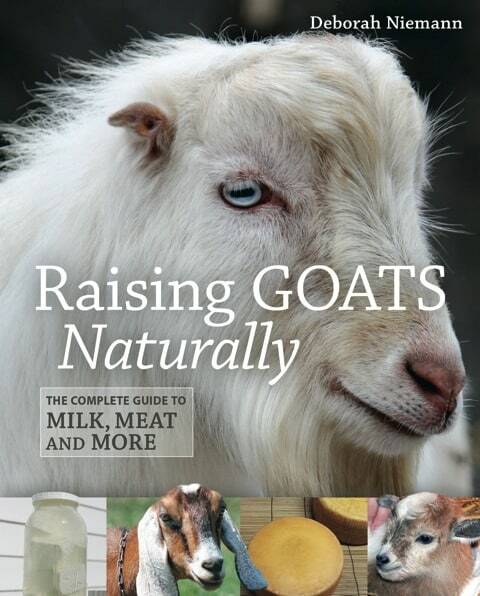 I love that you have a book out on Naturally raising goats. I love them and had a dairy herd for a while in my youth. The hardest thing I had to deal with is trying to get them to quit using my VW bug as a slide. My biggest problem is not having goats yet! 🙂 I’m very interested in learning all I can to prepare for my future goats! My #1 problem is not having friends who know how to milk to call on in an emergency. I don’t even THINK about going on vacation anymore but last year when I had the flu I had to lean on my husband to get me down to the barn and back so I could milk my does. I advertised for people who wanted to form a goat (and cow) milking support group. I did meet some nice people but my support group is still a dream. I’m not giving up. I think that if someone, somewhere could get a support group going and other people used it as a role model, soon more people would be getting goats, knowing they had help to call on–and, in my vision, the more people have goats, the more support for small family farms there will be and the world will be a better place. Love your idea to form a support group! Our #1 problem is finding a fellow goat lovers and mentors, and a very close second is a vet who is willing and knowledgeable about goats. Our biggest problem is that, besides not owning goats yet, we severely lack knowledge on the subject. Neither my husband or I have any animals other than dogs and cats. We will be starting from scratch when the time comes, though we do have friends who are knowledgeable. Other than that, we are green as green can be about raising goats. My #1 problem is that I haven’t been able to get goats yet! Start up costs are holding us back. We just want a few Nigerian Dwarf does for milk. My #1 problem with raising goats is going to shows, which i love to do, but the meanness of others when some people win and beat them. I guess i would say the jealousy of people is my #1 problem. I have lost 2 goats this year only a day or 2 after a show to no forseen causes other than poisoning. The goat i just lost after the National Goat Expo was our best Nigerian Dwarf Doe, she was perfectly healthy, no health issues and the vet said she was healthy as a peach and believes she was poisoned by someone, now tons of tox screens are being done to figure out what was used to kill my doe. We dam raise and love it, she was by far the best doe in our herd for many reasons, the best mother , best milker, and the best personality. She freshened 8/14/2013 as s 2nd freshener and she loved her babies so much and she loved the show ring, she walked in like she owned it!! Needing goats. I am researching and working on accuiring land so I can raise goats and other livestock. Hopefully soon. I think this book will help a lot. Our number one problem we face is start-up costs. We are on a small (10 acres), self-sufficiency homestead with no savings, no sources for capital, and only one person working outside bringing in limited income. We have to do things a little bit at a time. We’ve been here three years and it’s been slow going. We would appreciate more tips on how to do things for as low cost as possible. Thank you! -Most of all, have fun! don’t worry, goats are hardy animals! Thanks for the tips. Much appreciated! Our #1 problem would have to be selenium/ Vitamin E deficiency. We finally found a loose salt with added selenium that the goats LIKE, and that seems to have solved the problem. Last spring was the first year in quite a few, that none of the babies showed signs of deficiency when born. Just to be safe we still gave them a Vitamin Code Vitamin E supplement (contains selenium along with many other vitamins) mixed in honey when born just to be sure. This was the best treatment we found, when we were having this problem. It worked a whole lot better than the injectable stuff, and has fast results. Kids are usually up, and walking around within an hour. Black sunflower seeds are high in vitamin E and protein that will increase milk production. Our number one problem currently is the time and effort it takes to start all over again. We just purchased a new farm and are working on cross fencing and shelters and all sorts of things in preparation for winter. Great post – we love dam raised babies! I find it interesting that the common problem is fencing/keeping them in. My number 1 problem is divided between deciding when to breed does(and doelings) and moving them, I think. I am very interested in raising them as naturally as possible…this book looks very helpful! 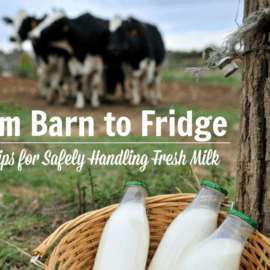 Love the post…I thought, when I began raising goats, that I was going to bottle feed…I didn’t. But this year we had several bottle babies…It’s SO not fun! Thanks for the great article. I already wanted to dam raise our kids but it was more of a gut feeling i.e. that’s how it works in nature, just like breastfeeding so reading many sourced reasons and explanations was informative. We don’t have goats yet. Trying to learn as much as possible in the next year to be prepared. I want to learn how to feed the goats a complete diet without buying commercial feed. Your book looks like it would be helpful. Not a goat owner yet, but think I would like to be. Thanks for this opportunity. My number one problem of raising goats is NO GOATS….. YET!! We bought a small homestead and have been working hard to clean it up and get it ready for animals, including goats! We have had goats tears ago and I am wanting to get some agaiin this spring. In your article, you mention that you don’t wean the doelings, what about the bucks/wethers? Bucks get weaned around 3 months so they don’t impregnate their sisters and cousins, but wethers nurse forever until they’re sold. My biggest problem right now is trying to not be overwhelmed by all of the information about raising goats. We are in the process of preparing a place for goats and then will purchase them. We are just closing on our farm this Friday. I think the major issue we will have is containment. Our new farm has a lot of fencing repair needs at this point and much of the fencing is for horses. As farmers-in-training we are looking forward to the challenges and blessings of dairy goats…and chickens…and market gardens…and shepherd dogs….and on and on and on! My number one problem is keeping our buck from destroying our barn… Especially in the fall!! My struggle is deciding whether to start out with kids and train them for milking or should I start out with milking goat. I had two lamancha goats in the beginning that we purchased from a 4H family here in Montana. The previous owner insisted on a rather stringent diet but I soon discovered via poor fencing that my goats loved foraging and their milk tasted better. My husband who had major allergies most of our marriage had none that year after drinking the milk. They were great for never having had goats before but they were bottle raised and rejected feeding their young. A move forced us to have to give them away. Because of Montana laws we need our own source of raw milk. Most of the goat farmers remove the babies early and that seems strange to me. How do I find a good goat or train one? i am convinced that natural farming is the best but surrounded folks who think I am just misguided. Animals should be a joy not a burden. We struggle with parasites…stomach worms…due to limited access to rotational pasture with good fencing. We bring them berry and shrub trimmings and grape vines from our property but I know our problems would be minimized if we could rotate. And there is always the occasional kidding problem that requires help from more knowledgable folks. But overall I would rate our goat experience a+. The biggest problem we have had is information overload and a lack of local resources to get good information from people who keep goats. We have one friend who just got her first three goats and she is still looking forinformation just like we are. I agree, problems were lack of knowledge. The biggest problem we had with bottle feeding is bloating. Our one little buckling we bought boated continually, so once I realized this, as we were new owners, and he was drinking water from a pail, I pulled him off. The other challenge we had with getting 4 kids, that we had to bottle feed, was no example by an adult goat for grazing etc. They also think as you mentioned we are mama. We plan on letting the mamas take care of their babies, once we are to that stage. Our biggest problem with raising goats is wasted hay from the feeders…I bet they drop half of it! We don’t have a problem with our goats escaping their enclosures….they don’t seem interested in escaping at all….but we provide hay free choice at all times, allow them to free range during the day and feed grain at bedtime. They have made the connection of us coming to their enclosure as “grain-feeding time” and they come running from the pasture to the enclosure because they want that grain! After that, we simply lock them up in their enclosures for the night. We do have LGDs to ‘watch over’ the goats while they free range and, thankfully, we have never lost a goat to predators! My problem as a goat owner is not having them yet! Working, saving up, and learning in the meantime! We have mostly Boer goats and a few mixed bred dairy goats. They are on a rotational grazing system with the beef cattle and sheep. This system works very well. The goats will stick to the rest of the animals. I never did have a problem until we had a few bottle fed kids. Then all hell broke loose. The bottle bums had this knack of finding any little hole in the pen and then the other kids and the lambs would follow them out. We use 55 gallon plastic barrels with a wooden cover to store feed. One morning we came to the feed shed and found a goat in all 5 barrels baaing because they couldn’t get out. They had jumped on top of the barrels and tipped the cover off and jumped in to feast. Thankfully none of them bloated. We found that if you have any lambs or kids to bottle feed sell them and never put them in with the rest as they are good teachers and the others very good learners. The best way to raise any animal is to let mom take care of them. My goats are all Dam-raised even though we were advised not to. We have had such a wonderful experience with our goats. The only problem we have is that we have to fence in all of our gardens because we let our goats roam our property in the daytime and put them in at night. We don’t have goats yet, too small of a yard, but I’m reading up on everything that I can before we get them. This book sounds like a definite must-read! My number one problem with raising goats so far was when I had to treat them for pinkeye! I’m a newbie goat owner and a few days after getting my first goats they came down with horrible pinkeye. We figured it out and both fully recovered thankfully. As someone already said, my problem is also, that “I don’t have any goats yet!” Although within the next year or two, I might invest in some netting, so I can host some goats on our property to contain the blackberries and other plants that have taken over the land. We’re trying to put in an offer on a property, that has been vacant for a while, and as expected in our area, the land has been overgrown with blackberries to the point of us needing to trim it to the ground, till it, and reseed it all, before we can call it “pasture”. My number one problem is the lack of knowledgeable vets. There are none within 200 miles from where I live. The rowdy goat babies jumping on the milk bucket. We definitely want to try keeping them on the doe next time. Thank you for this post. We got some grief when we decided to dam-raise our babies. We went back and forth on what to do but when the babies were born, it just seem like the right thing. Our babies are VERY friendly but not all up in your face. We milk once a day and if we need to be gone for any reason, the babies take care of the milking for us. This works perfect for our family. Now, our biggest problem…someone always seems to leave the gate unlocked when it’s time to leave. There is nothing like chasing goats around the yard in your Sunday clothes. Fencing has been a big problem for us, they tend to find something better on the other side. We have had a bad year with illnesses. We had a scary case of listeriosis, and we have not been feeding them feed, just letting them free range and some molasses. We also lost one to Johnes and need to have the others tested. Learning the hard way. Probably the worst problem we have had is the one goat that we bought from someone else that bottle fed, tries to get out of the fence as much as she can. No knowledgeable vets in our area. Bottle fed babies are pests as they think you are their mama and we’ve had bad experiences with our bottle fed doelings when they kid themselves the first time. So my hubby has decided that no matter how cute or friendly they are, we won’t be keeping any bottle fed kids once they are weaned. Usually we keep the doelings and sell the bucklings. We have Boer goats but I would really like a few milk goats to become more self-sufficient. I don’t know which dairy goats would be a good choice. My number one problem with goats is the fact that they are a little spoiled and don’t respect my space. Multiple handlers with contradicting handling techniques keeps bad habits going strong! My biggest problem is finding enough shelter for multiple herds in our wet Oregon winters. My main problem is that they are just too smart for their own good. That plus all goats are little Houdinis and MacGyvers. My problem is inexperience. A couple years ago my husband and I decided we wanted to get out of the city and move back to the country. Eight months ago we found and bought our homestead. We have both raised rabbits and chickens before but never goats. I’m the type of person who reads, listens and learns before buying. And that is why I would love to have your book. I know I will make mistakes, but the more I learn the less likely I am to make serious mistakes. People at work think I’m crazy to be giving up what I have for a life that is full of hard work. You see, I am in my late 50’s and they look at retirement as a time to slow down, relax and travel. Which for some people that’s OK. But I’ve lived the “simple” lifestyle before, when my kids were young. I miss it. And I find the time spent on our “new” homestead to be the happiest of times, even during the hardest times. I’m planning on giving up my full time, high stress job within the next year. I’m looking forward to spending the majority of my time on the homestead gardening, canning and taking care of our animals (which goats are soon to become part of). Just remember – you are never too old, age is a state of mind. You are so right, Kim! I’ve sold goats to quite a few people starting a herd when they retired. #1 problem is the cost of fencing, #2 is that one goat keeps getting out! She’d prefer sleeping on the dog bed in the house to her shelter. Hi: As a fence was already in place and pallets were easily obtainable, and as many-having good neighbors: shelter was not a difficulty. Skittles had not had hand raising and then neighbors dog attacked both her and Maggie. They had so bonded that Skittles saw me as an interlopper. Maggie passed away 18 months later and the grieving process would have to be the most difficult. Skittles stayed with Maggie and I while I tried to do all the veterinarian had said but to no avail. Skittles stayed with her until Maggie was picked up. She continued to stay in shelter, not wanting to eat, not wanting me close. I brought out a hugh stuffed bear, rubbing things of Maggies on it and she eventually layed with it. I would sleep out there with her though again she did not want me close and would go to last place Maggie was. Oh was so difficult but time heals. She is pregnant now (course worried when buck was sent home, bless a friend who brought over her female she wanted a new home for-God sees a need wow) We play tether ball, walk and Nuguet is coming around too having not received much in the way of handling. Now to figure out how to get Skittles to allow me to milk her eventually. Always a blessed adventure around here. My #1 problem at the moment is finding the right goats. I am searching for a few pregnant Apline does to start my herd but no one around here seems to be selling any. Boers are very prevalent in my area, as well as cross breeds, but I have no interest in purchasing Boers or crosses so my dreams of being a goat owner keep being pushed back. My #1 problem with my goats is finding a competent vet. We have two vets in town, both of whom will cheerfully “take care” of my goats, and neither of whom actually knows what they are doing. As a result, I am educating myself and learning to do all the hard things. I think that’s a good thing, but I still wish we had a really good Caprine vet in the immediate area. Getting my first goats on November 30th, 2 nigerian dwarfs, I am so excited. I’ve already read Deborah’s book front to back twice, she is a great source of information. My major concern with allowing uncontrolled nursing would be (I don’t have a milking nanny yet, just a very spoiled pet wether) that I want the milk in commercial amounts for soap-making and would need to see how much I lost to the kids to make it worthwhile. For those afraid of goat-keeping, don’t be. I had tons of people telling me all sorts of horrible things, but other than trying to find the one tiny hole in the fencing of his shelter, none of it turned out to be true. And on the plus side he’s a 4-H market wether who was presumably bottle-raised, so when he got out, he didn’t go far, just nearer to the house looking for me. I think my number one problem with my goats is feeding. We live on a little over one acre, and we either are constantly moving fencing to allow them access to brush, or I have to take time daily to cut brush for them. I also have had goats for many years, and have watched as alfalfa prices have climbed, since we do not have a storage barn, buying one bale at a time is running 17.00. So I have learned to be creative, as I also am trying to feed my goats organically. I have had very healthy goats, over about 15 years, have never had any serious health issues. I am interested to read more about dam raising, as I have always bottle fed babies. I can’t stand the noise of separating them at weaning. That would be my number 2 problem, dealing with noisy goats. I am curious how you deal with this. My number 1 problem is deciding which kids to keep every year. I’d always like to keep more than I do. Raising Nigerian Dwarfs, my biggest problem is deciding what kids to keep and which to cull. There is very little information that instructs breeders about what makes a great doeling from a so-so doeling. Every breeder seems to have their own formula; for example, bucklings will not be kept in tact unless from a second freshening from a doe with great udder. What makes a buckling from a first freshening lesser in quality than a third freshener? The biggest fear is to sell a doeling or buckling that was worth retaining. It’s the problem of culling versus keeping. This is a problem I remember well when I got started! Now that I freshen 12-18 does a year, it makes perfect sense to only keep the bucklings from the best does because there is no way that all of them will be sold as intact bucks. Why would anyone want to buy a buckling from a first freshener when they could buy one from a doe with a great milking history? If a first freshener turns into a great milker, you can always keep a buck from her then. In fact, some years, the bucks from great milkers don’t sell for several months, whereas the does are often reserved before they are even born. It is a sad fact of life that at least 80% of bucks don’t remain intact because you just don’t need them as bucks. As for which doelings to keep, I usually keep doelings from my oldest and best milkers for the same reason. In fact, doelings from my first fresheners are usually the last ones that sell also. Does that help? Yes, that makes a lot more sense now! Thanks for clarifying that. I am sure there are show standards for the goats that specify traits in goats too. However, I wish there were better guidelines about comparing kids. For example, I have three doelings from different dams, how can I find out which doelings are better than the others? I am sure this comes with experience, but I would hate to cull a doeling by mistake and keep one that is weaker, which I felt was stronger. That’s the advice I’ve been eager to hear about. I am going to go with my gut feeling and keep this little doeling that has the “keep me look.” She has such a refined face and gorgeous fur. This was my first Nigerian Dwarf kidding. It’s great to have found this forum. Another hard thing about goat raising is the disbudding process. I did it my first time this summer, and it is by no means an easy task! I ended up doing a perfect job on my doeling and a so-so on my bucklings. Any advice on this process or techniques to get a better burn once? I think I am more focused on being afraid not to cause any damage to the brain that I did not burn the horns well enough (even though I thought to see the copper ring). I know this is one of the touchier subjects about goat raising, but a goat with horns can be aggressive with other goats and with their handler. Plus, some goats cannot be shown unless they are disbudded. #1 Problem: The mental health of not being able to go away from home any longer than overnight! The two big problems I am having is the start up costs and the mass overload of information that is out there in regards to tests and medications to give goats and how to raise and breed them. Everyone has a different opinion and it is hard to decide what decisions to make. I want healthy happy goats but who is to say which way is the right way? I spent a whole book answering that question! 🙂 I know the contradictory info is the most frustrating thing for new owners. The problem is that goats are a “minor breed” in this country, and as such, there was very little research done on them until quite recently. So, a lot of vets were basically flying by the seat of their pants when making recommendations on care. I had the parasite section of my book read by a professor who studies parasites on goats, and he told me where a lot of the misinformation came from — like the suggestion to use garden insecticides for lice! 🙁 Vets used to say that all the time until such advice was made illegal in the 1990s — the manufacturer even says on the label NOT to use it on mammals. Unfortunately, a lot of that info is still floating around out there. We still need more research, but at least we are learning some of the more important things — like nutritional needs. I also had another professor who studies goat nutrition read that section of my book. So, although I’m sure we’ll learn more in the coming years, I can say that this book is as up-to-date as it can possibly be right now. The #1 problem I am anticipating when I get goats next year is predator protection. Bear and coyote specifically. Training the goats to have good behavior after they come in to the herd. Though they are CAE CL free it is sometimes difficult when you get goats from people who just have them running wild all over. It makes them difficult to live with even if you have good fencing. My biggest problem has been figuring a feed ration. I don’t like the pellet idea, too much processing. I think I have a good one now, but it has taken a few years! Also, the addiction to Nigerian kids! I have a doe due in December to keep me from looking for them! My number one and biggest goat issue is escaping and being places where goats should not be. The dexterity and cunning is unparalleled by any other species on our farm. Even with field fencing and a hot wire our goat can work it’s way through like a mission impossible, alarm-laser-beam-avoiding-diamond theft. We have finally secured the parameter and now we have sneaking into other animal pens to steal food. It drive us nuts. On the farm we are building the goat enclosure will be a fort Knox type enclosure with no options…… hopefully! My main problem with goats is keeping the numbers down! Culling is so HARD! My biggest goat problem right now is not having any! Soon we move to more acreage and some Nigerian Dwarfs have been on my min for years! I have had my goats for 1 yr and I feel I am constantly learning new stuff that I just don’t know. I just took on my first herd of goats in March. My biggest problem is that my goats are very skittish of me and that makes me nervous when it comes time to milking them. Im hoping it will only be a ruff start and then my dams will start to get used to me. I dont have any goat friends to ask or get advise from so im running on hopes. My number one problem is keeping peace between my two bucks. My #1 problem with raising goats is our fencing. We have regular field fencing and the goats get their heads stuck since we don’t dehorn our kids. I routinely listen out the door several times a day if I’m working inside for crying goats to see if anyone is stuck. We usually have to “save” one from the fence a couple times a week. My number one problem is that I need more pasture fenced in. Have you considered using ElectroNet? It costs a lot less than permanent fencing, and it’s easy to move. I would like to see the day where the vets and drug companies are more knowledgeable about goats, and thus cater more to owners that have goats. I find that a lot of vets (not all) lack sufficient knowledge when it comes to treating goats. And when you look at medicines and dewormers, there are very few that are labeled for goats making it difficult to choose the correct medicine to administer, as well as the correct dose. On a side note, I long for the day where I no longer have to work at a job to support my goat habit. I prefer to have my goats kid naturally, with me present at the time. Unfortunately, my goats and work schedule don’t always cooperate. #1 problem? That I can’t keep them all! I feel much better about dam raising my kids after reading this. We’re new ‘ish to goats and our doe, Lucy, kidded this spring and they are still nursing (7 months old). I was feeling guilty but, now I’m leaving them on until Lucy see’s fit to wean them on her own. Thanks! #1 problem as a goat keeper: I love my vet and think they are great but… I wish they practiced natural medicine or at least supported our choice to raise natural animals. I am wanting to learn all i can about goats i have had then for 4 yrs now but my females when born dont do well at all but the boys do fine they grow really well . We are a total newbie with goats and got a mom and baby pygmy over the summer. We were very nervous at first but now absolutely love the experience. My number one problem is living in town and having to board my stock, depending on someone else to provide care. My #1 problem is not having any yet!! I hope to get 2 Nubian doelings soon and want to read this book! My #1 worry is having to find homes for the babies……………………..
My biggest problem is keeping my fencing tight. I have a couple that seem to find the smallest of openings and end up in my yard. Problem #2 is finding a knowledgable goat veterinarian in my area. I have aquired more knowledge from trial and error than I can ever get from my local vets. We raised goats & sheep until our house burned & we had to sell everything to get ourselves back on our feet. I miss them greatly. I’m looking forward to getting back into raising them again. I just purchased a young nubian doe & should be bringing her home in about a month. We’ll also be getting some meat goats, but not sure what breed yet. Right now my #1 problem is that I’m trying to get the fencing & barn ready. I don’t have goats at the moment but plan to soon. Over the summer I apprenticed with a friend who has goats and the biggest problem seemed to be figuring out how to manage the herd in the most economical and labor efficient way. Finding someone to goat sit when we travel haha! My number one problem raising goats is they love to head buck my daughter down all the time. Our number one problem raising goats is the milk didn’t taste very good last spring, and we were really hoping to be able to use it. We have switched breeds, and are closely monitoring feed, so we are hoping that when they kid this spring that we will have better success!! 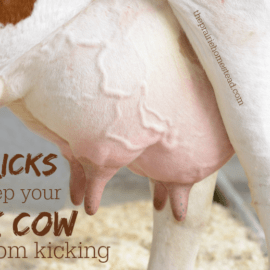 Off-tasting milk is usually caused by not cleaning the udder and putting the first few squirts in a different container (which you can give the barn cat or dog). Of course, leaving them with a buck will also cause a goaty taste. We clean the udder, squirt the first few squirts outside the bucket, and chill the milk quickly. There is no buck on the property. Was it goaty, salty, or something else? I would say very goaty. They were not on the best hay last spring, as hay was hard to get a hold of at that time. It was also suggested that it could be the breed. They are 3/4 Alpine 1/4 Tog. We’ve since added to our herd and have a doe from last year’s freshening that is 1/2 Oberhasli and 2 full bred Oberhasli that we will be breeding soon. Plus, we have very high quality hay this time around (in addition to their grain). Unfortunately some goats do just have more goaty milk than others. Hope it’s better this year! The #1 problem I have? Our girls have recently become cuddle bugs and I’m pregnant. My biggest problem right now is not being able to sit with them and cuddle them til the sun goes down. 😉 Thanks for this opportunity! Our #1 problem is they are too smart for the fences. All of our animals respect the 3 strand polywire (interior) paddocks we setup. But the goats learned one day that they could jump it and haven’t stayed in since. We have to constantly retrain them to the fences using our electro nets and they are even then, always testing them. I really need this book because I expect to get 2 kids in the Spring and I know nothing about raising goats and really want to know what to do. I am not a goat owner yet, do to garden organically and researching goats…looks like a great resource guide. our biggest problem is not enough land! we don’t even have enough for one goat 🙁 but we are looking for a few extra acres and plan on getting goats or a pig as soon as we get a garden and our chickens established on it. I’m not yet an owner of goats but I plan on it in the next year and would love to have as much information as possible before starting! My number one problem with my goats is cutting enough hay on our small patures to feed them all winter. Our pastures are so small and so full of rocks and stumps that we have to cut hay with a scythe amd haul it on tarps to the barn and the homemade hay press that my boyfriend made. Our # 1 problem is probably when a new goat or a goat or goats that have been in separate pens for a while are reintroduced and the others pick on them at first (establishing their dominance or order). I believe in letting the goats keep their horns but in this situation a goat can get hurt once in awhile. 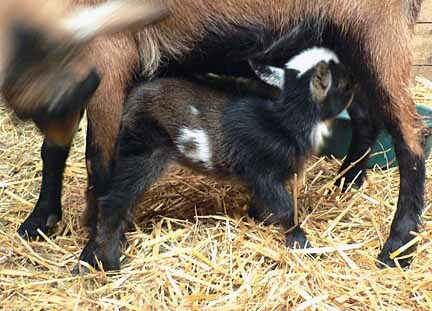 #2 is when a goat has a congested udder before kidding and then has quads! Thanks for the chance to win this book! The main reason I do not dam raise my kids is that I can never seem to get the doelings that I retain to wean. 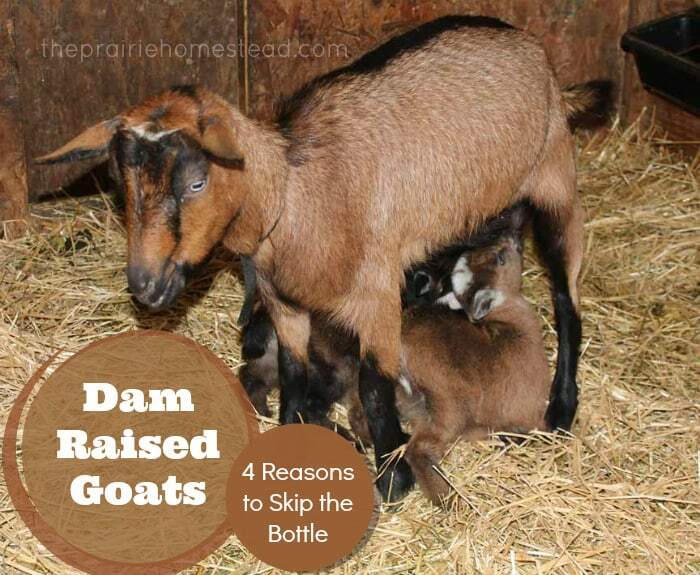 I agree with the points listed here on the benefits of dam raising, but since I keep my goats for milk, it’s not practical to dam raise when a doeling is stealing all the milk after she is many months old. That would be the #1 obstacle for me. I’ve tried teat tape, separation, hot peppers, and more. I once had a 4 year old that was still nursing her dam!!! We separate the kids overnight when they’re two months old, so we get the morning’s milk. We discovered years ago that after about three days separation, the doe’s supply starts to go down, which is one reason we quit weaning. We actually get more milk as long as the kids are nursing. (See the study linked in the article for the research on oxytocin released when kids nurse.) And the doelings grow faster when they are getting their mother’s milk, which means I am more likely to be able to breed them to kid as yearlings, which means I will be able to milk them a year sooner. Most kids stop nursing anywhere from 3 months to 9 months. I’ve never had a doe nurse after her mother kidded again. We had one try once, but her mother wouldn’t let her, and she didn’t try again. I have heard of it happening, but it is very rare that a doe will continue to nurse after her mother has kidded again, but a 4-year-old nursing is quite an anomaly. I would actually be wondering if she had some sort of nutritional deficiencies, as some individual goats do have more problems than others. I would have to say health control and/or worm control. It seems that each goat is different even in the same breed. We are looking into getting goats…so far the problem is shelter. building a cost efficient place for them! The biggest problem that we have come across is figuring out exactly what to feed our Nigerian Dwarf Goats. It seems that most websites are contradictory to each other. Some say to feed grain to bucks/wethers and some say not to do it at all. Then some say don’t feed alfalfa and others say you should, but only with a certain ratio of grain. In other words, it gets confusing. We are still working on getting them on a good healthy diet. Diet is fully explained in my book, but there is no single right answer, which is why you see people saying that different things work for them. If you have good quality grass hay, bucks and wethers do not need grain, and in fact, grain can cause urinary calculi. If your boys don’t do well on grass hay alone, you may need to supplement with a little alfalfa and grain, but because of the risk of UC, you should give as little as you can to maintain their body condition. The only time I personally have ever needed to give grain to my bucks is in the middle of some of our wickedly cold Illinois winters when the temperatures are going below zero. Fencing is the biggest problem. My problem is that we haven’t been able to afford goats yet, but are hoping to soon. I hope to raise Nigerian Dwarfs. We have the space, but want to make sure we have proper fencing before we make an attempt. I am very interested in raising all our animals in the most natural ways possible. Thank you for your offer! I hope I win this, I sure need it! I have two goats and it was so hard to ween the baby, who is now six months old, even after months of being separated will try to nurse, I had considered that the next time I will bottle feed instead of letting them nurse, I would of course use the mothers milk, thought this might make things easier, thanks for the postings, this has helped me allot. My husband said I did not put my biggest problem, but I thought I did, my biggest problem is weeing the babies, but from what I read you are not suggesting weening them at all. My other biggest problem is them horning each other! You are correct that I’m suggesting that you not wean them at all. By letting them continue to nurse, the doe will actually produce more milk, the doelings will grow faster, which means you can breed them sooner and get them producing milk. Plus, the kids will be healthier. My biggest problem is not having enough money to buy all the goats I want! And all the herbs and herbal mixtures I want to use to treat them naturally. Not having the correct setup to rotate pastures well comes in as a close second. My biggest problem is the fencing. Our farm had older fencing and we’ve had to replace as much as we can as often as we can. I love our goats.. I am anxious to be able to change/rotate pastures soon. My problem is that I don’t have goats, yet! I really want to start next year and my 4 year old grandson would never go home. He has wanted goats for at least 2 years since he saw them on another farm. My biggest problem is I don’t have any! I would love to learn all about them so I can be ready when we can get some! My #1 problem is that I don’t own any goats yet! I’ve been gobbling up as much information as I can about them. My #1 problem with goats is getting to where I want to be with raising them naturally! Aka: having enough mini-pastures fenced off to rotate extremely well and have enough permaculture gardens to feed the goats year round, especially with enough extra harvested to have healthy, non-GMO, and not expensive grain to treat them to on the milk stand. I would also love more time to give each and every one of them massage, raindrops and oil applications, etc. 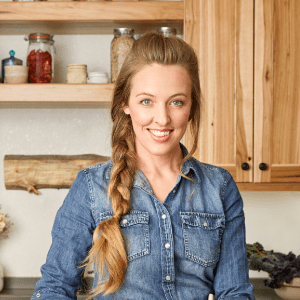 We had the pleasure and honor of hearing you speak at the Mother Earth News Fair in Puyallup, WA on the topic of “Choosing Livestock for Your Homestead” right after we purchased our farm but before we got our first animals. Since that time we have acquired our first goats, a set of triplets. We have two daring doelings and one wether. Next year we hope to add more. In the meantime, I think our biggest challenge really is being new and the learning curve. I have a great local mentor. But for some things like planning for their first winter I wish there were things I knew to prepare for in advance. The kids seems to be doing really well and are healthy, happy, great tempered and hardy. But, I would rather operate preventively and prepared then in crisis mode. The biggest issue i have right now is getting my does bred. My number one problem is not being a goat-owner yet. But I have had the opportunity to share in the care of a sweet doe over the last year. I’m totally hooked and getting set to add some milkers to our new farming endeavor in the next few months. My problem? I don’t have any – YET! We’re planning a move within the next year back to the country and I can’t wait! While patience isn’t my best virtue, I’m using the time to learn, learn, learn – and your site is a major part of that for me. Thank you! My number one problem with our our goats has been getting a good heard guardian that doesn’t eventually think the adjacent road is their business and then get hit . The second hardest thing is not having had any does “take” but we have only been at this for two years with a 4 yr old Alpine and one year with a young set of Nubians. This year we bought an Alpine and a Nubian buck in hopes of increasing our chances of kids this spring. Darnedest thing happened though…the Alpine came into milk with out kidding! She only gives a Mason jar a day but , hey, we’ll take it. My number one problem is deciding on a breed of goat to get! We can better plan for our barn once we make this decision. We love Deborah…she’s the main inspiration for us wanting our own dairy animals! My #1 problem is keeping the goats out of eachothers grain bowl! i use herbal wormer so if one goat gets too much and another not enough, it is not a good scenario. they often wont eat the herbal wormer top dressed on their food and i have to give it to them in a syringe or spoon. I do leash them up during graining so they do not eat each others food and pick up any uneaten grain before unleashing them. still… this is my biggest issue or aggravation. I forgot to mention that i have 1 bottle fed baby, and though i agree it is always better to dam raise a goat, if the baby is for a pet only, bottle feeding provides a stronger bond between human and baby. I love my little guy Bobo, a bottle fed wether, and am far more in sync and attached to him than my other goats! he will be my baby when he is an OLD MAN 😉 I have 4 Pygmy goats, the other three were all dam raised. Wild? maybe.. but more like goat instinctive! more so than my little guy who understands my every word and talks to me more than the other goats. He has done well making his spot within my small herd though, as the golden boy, who afterall was here first..
My biggest problem….is knowing when there is a problem! I’m a new goat owner and tend to worry too much about things. I’m thankful for my friend who loves goats and has had them for years. Whenever I call her with a worry, she comes right over and checks things out. It’s usually either a simple fix or normal goat behavior, but she never makes me feel silly. Slowly, I’m getting the hang of it! Great post and timely post 🙂 I read your Goat 101 Series before I got my goats, but now that they’re here I’m going to go back and read it again! My number one problem with goats is they won’t stay in the fence that is currently in the pasture. There is over 20 acres of good stuff for them to graze on but they found out that they can jump over the fence and come up to the house to graze across the gravel road on dead dusty weeds that they think tastes better than all the browse and graze that they could ever want. So the real problem is just having enough money to refence the 20 acres of property to keep them enclosed. Well, seeing as I just got my first 2 goats this past Saturday, the only problem I have run into is staying out of the barn!! If you allow the does to wean their babies naturally….how long does it usually take? We have a Boer doe and a Nubian doe. Their kids are 4 months old and we have not weaned them yet. I’m new to all of this. I would like to allow our goats to nurse their kids naturally and wean them when they see fit. So at what point do I milk the mother goat? Once the kid is weaned? Just before it’s weaned? I would like to cause the least disturbance to the goats as possible, whilst being able to have milk for us humans too. How do you do the?